A cheery status update from Janet, who appears to have enjoyed at least two canal holidays in 1980! As usual she is making the best of things, despite the inclement British weather. The card is post marked is ‘BANBURY 1.15pm 7 OCT 1980 OXON’ and also carries the old favourite ‘Be properly addressed POSTCODE IT’. In the UK we all hear about Banbury Cross from a young age thanks to a traditional nursery rhyme – although I suspect few of us have ever visited and some may not even realise the connection! The copyrighted (1977 Millimetre Limited) design on the front of this card has a Christmas feel to it and this combined with the Christmas stamp suggests that this might have been a December communication. However, the card is dated 31.7.83 and postmarked ‘TWICKENHAM 2pm 1 AUG 1983’ It also carries the old favourite ‘Be properly addressed POSTCODE IT’ and, indeed, this card still arrived despite not carrying the postcode – nine years after they became a required part of all addresses! Status updates: The big news about her first house purchase is thoughtfully contained to just the one line. It was probably her Dad’s 50th – an age so great (when you’re in your early twenties) that it couldn’t be spoken aloud! 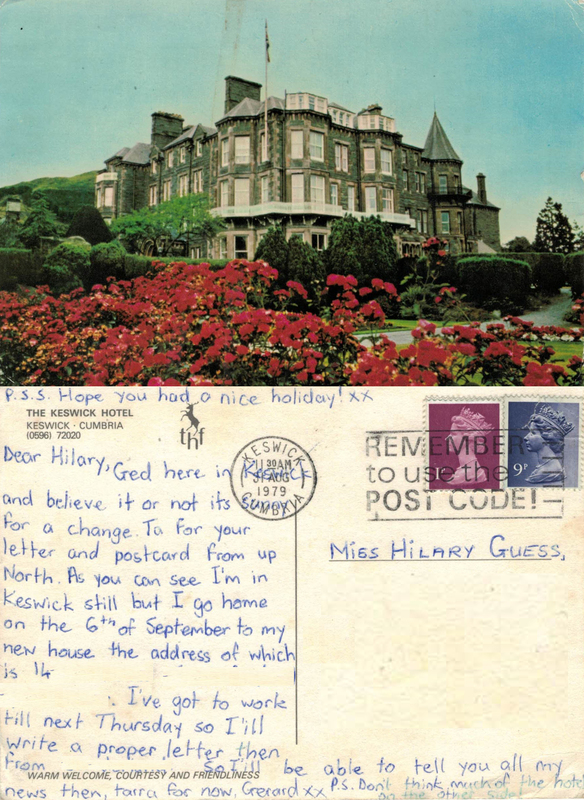 Gill was, and continues to be, very good at the quick ‘keep in touch’ note, although these days it’s generally by email 🙂 I was back home after a period of travelling and had probably mentioned in a letter that I didn’t know what I would be doing next (or for the rest of my life!) career wise – hence her kind words at the top.